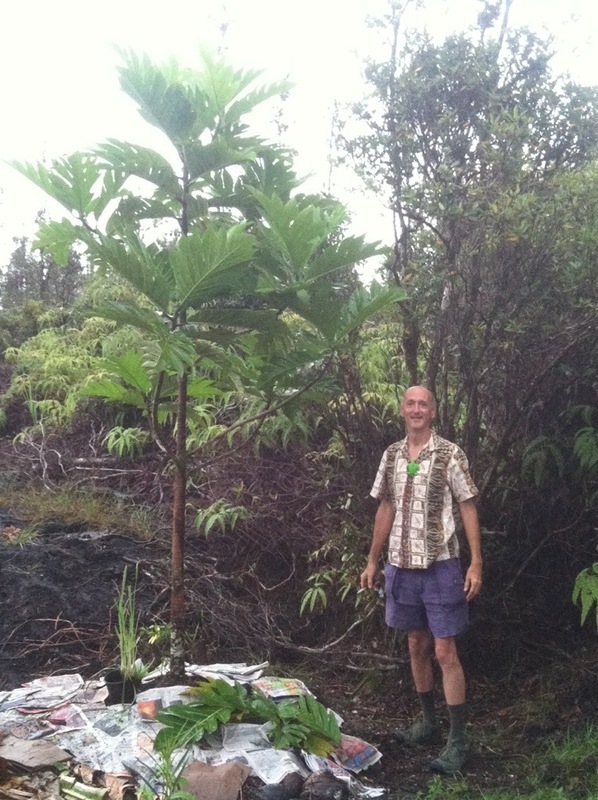 On Thanksgiving, our church member Pansy invited us to come to her house if we would like an ulu tree, asking if we didn’t mind digging it up. We said we’d LOVE to have a breadfruit tree and digging it up would be no problem. We got to her house about 3 pm yesterday, and she and her husband Jim showed us the trees they were hoping to be freed from. The tree pictured above was growing under it’s parent’s shadow. It took us 3 hours of digging, but we did it! We loaded the tree just before it got really dark. Jim and their son Julien helped with the final digging and loading into our truck. Thank you Pansy, Jim, and Julien for the beautiful tree and the help getting it up and out! We got home and planted it right away (in the dark) in a compost pile of mac nut shells and pieces* and a little soil. (*We got the mac shells from a business that makes mac nut biodiesel. They couldn’t use the shells and pieces because it had gotten wet and was molding and shared with us for free :)!) Because we got the tree so close to Thanksgiving, we named the tree Gratitulu, Tulu for short :)! The picture above was taken this morning around 7 am. What a lovely gift… and a fun name for the tree! A tree twice as tall as Mark, and a lovely one! How deep were its roots? I love the idea of calling it a gratitude tree. The roots were on rocks, so they only went about 8″ down. The circle we cut around the tree had a 5′ diameter (we are not sure how far the roots went out from the tree). 🙂 We did stop for a break for fresh squeezed lemonade from Pansy. How fun to read of your new Thanksgiving tree, and the expansion of your new lives . Remind me of which island you are settling into? We are on the Hilo (wet) side of the Big Island. So nice to hear from you!! and cold — you have pleasant temps. Thanks for sharing your developments. Betty and I send our love. Lots of love to you too! It is currently 75 with a high today of 81. The sun comes and goes, sometimes we have lots of clouds. We just had lunch– one of the most interesting/creative we have had in a while. We took a mamay sapote (which tastes a little like a SUPER-SWEET pumpkin pie) and put the meat of the fruit in a large bowl. We added seeds from four or five lilikoi (to add a tangy flavor). Then we opened an avocado and scooped our mamay-lilikoi mix into the hole left from the seed. The mamay has a very bold, deep orange color, so I joked we were having “vegan salmon-stuffed avocados”! We oped three avocados and each had 3 halves. We still had some mamay-lilikoi mix (but too full for more avos) so we added what we have added before–chocolate powder, such as used for baking. The mamay is sweet enough, that by adding chocolate powder turns it into a chocolate pudding.